This is a lovely dress that friend and fellow Etsy seller Katie (Dose of Happy) pointed out to me when I was at a big vintage textile event a few weeks ago. We both loved it and I said right away "Well if you're not going to buy it, I am." 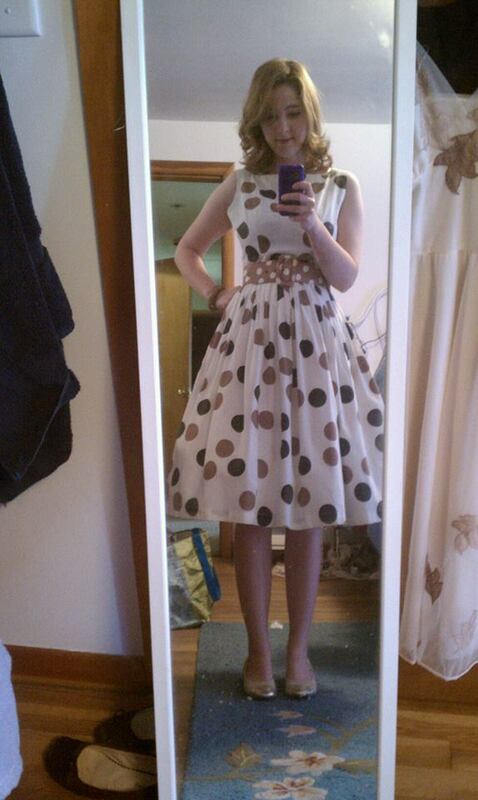 I figured it would go into the shop - people adore polka dots (well... I adore polka dots and the general consensus is that the rest of the world seems to as well!) After a heavy overnight soak in oxyclean and a bit of scrubbing, I put it on to go do a photoshoot and decided that it wasn't going anywhere except my closet. With vintage clothing, finding something that's perfectly fitted and flattering is not easy... and you don't give it up easily when you do find it!